Dimensions 1 by 6.75 by 9.75 in. Amazon.com description: Product Description: In this new edition, Tim Budd examines the ideas of object-oriented design and software construction, presenting concepts of object-oriented analysis and programming in a language independent fashion.The book includes sections on inh eritance, static and dynamic binding, and the development of exciting new object-oriented languages such as Java, Beta, and CLOS. 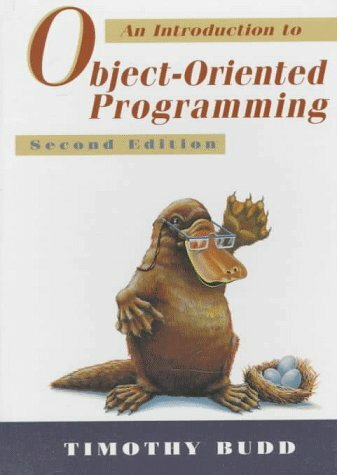 About: In An Introduction to Object-Oriented Programming, Timothy Budd provides a language-independent presentation of object-oriented principles, such as objects, methods, inheritance (including multiple inheritance) and polymorphism. About: In this new edition, Tim Budd examines the ideas of object-oriented design and software construction, presenting concepts of object-oriented analysis and programming in a language independent fashion. About: A comprehensive guide for programmers that want an introduction to object-oriented programming and design with a survey of the most popular languages available.